The Simpson Strong-Tie Strong-Drive SDS Heavy-Duty Connector screw is a 1/4"-diameter high-strength structural screw ideal for various connector installations as well as wood-to-wood and engineered wood applications. It installs with no predrilling and has been extensively tested in various applications. The SDS is improved with a patented easy driving Type-17 point and a corrosion-resistant double-barrier coating. The SDS Strong-Drive 1/4" wood screw line has expanded to include stainless-steel SDS screws in 1 1/2" to 3 1/2" lengths, suitable for fastening Simpson Strong-Tie stainless-steel products. Offering the same easy-driving, split-reducing installation of the standard SDS screw, these screws are made from Type 316 stainless steel. The new stainless-steel SDS screws are appropriate for higher-exposure environments where maximum corrosion-resistance is required. A flier providing features, benefits and load tables for the double-barrier and Type 316 stainless-steel versions of the Strong-Drive SDS Heavy-Duty Connector screw. 2009/2012 IRC Compliant Spacing for a Sawn Lumber Deck Ledger to Band Joist with 100 PSF Live Load and 10 PSF Dead Load. Sole Plate to Rim Board Shear Connections with Screws. Soleplate-to-Rim Board Shear Connections with Screws for Canada. Screws may be provided with the 4CUT™ or Type-17 point. Allowable withdrawal load for DF/SP/SCL is 172 lb./in. and for SPF/HF withdrawal is 121 lb./in. Total withdrawal load is based on actual thread penetration into the main member. LSL wood-to-wood applications that require 4 1/2", 5", 6" and 8" SDS screws are limited to interior-dry use only. Minimum spacing requirements are listed in ICC-ES ESR-2236. Noted loads are based on testing per ICC-ES AC233 and assume a minimum main member thickness of the screw length minus the side member thickness. All other allowable loads are based on the NDS-2012 and a minimum penetration of 6D = 1.45" into the main member. Values are valid for a connection involving only two members. Where the side and main members have different specific gravities, the lower values shall be used. Allowable loads are also applicable to structural composite lumber (e.g., LVL, PSL, and LSL) having an equivalent specific gravity of 0.50 or greater. Allowable loads are shown at the wood load duration factor of CD = 1.00. Loads may be increased for load duration by the building code up to a CD = 1.60. The Designer shall apply all adjustment factors required per NDS. Loads apply to corresponding stainless-steel models. For in-service moisture greater than 19% use CM = 0.7. Allowable loads are based on Simpson Strong-Tie® laboratory testing with a safety factor of 5.0 applied to the average ultimate test load. Allowable loads are based on 1 1/2" thick main members and assume no gap between side and main members. For applications with 2x side members, use allowable loads based on the lower of side member or main member species. The Designer is responsible for the design of wood members. Allowable loads are based on testing per ICC AC233 and are limited to parallel-to-grain loaded solid-sawn main members (2" nominal). Wood side members may be loaded parallel or perpendicular to grain (see footnote 4). 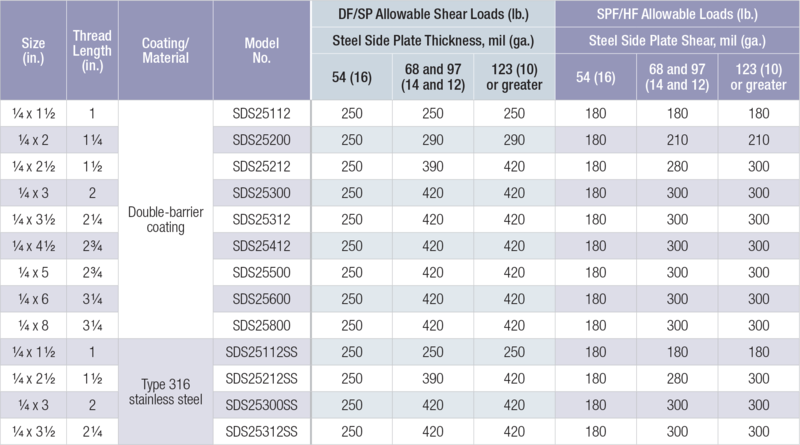 DF/SP allowable loads are based on wood members having a minimum specific gravity of 0.50, and SPF/HF allowable loads are based on wood members having a minimum specific gravity of 0.42. Where the side and main members have different specific gravities, the lower values shall be used. Allowable loads are shown at the wood load duration factor of CD = 1.00. Loads may be increased for load duration by the building code up to a CD = 1.60. Minimum spacing of fasteners is 3" o.c., minimum end distance is 3" for all parallel-to-grain loaded members, or 4" for all perpendicular-to-grain loaded members, and minimum edge distance is 3/4" for all parallel-to-grain loaded members, or 1 1/2" for perpendicular-to-grain loaded side members. Screws may be installed with an intermediate layer of wood structural panel between the side and main member provided the wood structural panel is fastened to the main member per code and the minimum penetration of the screw into the main member (excluding the wood structural panel) is met. Solid-sawn band joists shall be Spruce-Pine-Fir, Hem-Fir, Douglas Fir-Larch, or Southern Pine species. Ledger shall be Hem-Fir, Douglas Fir-Larch, or Southern Pine species. Fastener spacings are based on single fastener testing of the Strong-Drive® SDS screw with a safety factor of 5.0 and include NDS wet service adjustment factor. Multiple ledger plies shall be fastened together per code independent of the SDS screws. SDS screw spacing values (above) are equivalent to 2009 IRC Table R502.2.2.1 and 2012 /2015 IRC Table R507.2, based on testing of the Strong-Drive® SDS screw with a factor of safety of 5.0. The table above also provides SDS screw spacing for a wider range of materials commonly used for rim board, and an alternate loading condition as required by some jurisdictions. Screw models SDS25312, SDS25312SS and SDS25500. Allowable loads are based on testing per ICC-ES AC233 and are limited to parallel-to-grain loading. Minimum spacing of the SDS for sawn lumber applications is 3" o.c., minimum end distance is 3", and minimum edge distance is 5/8". Minimum spacing of the SDS for LVL and LSL applications is 6" o.c., minimum end distance is 6", and minimum edge distance is 5/8". Wood structural panel up to 1 1/8" thick is permitted between the sole plate and rim board provided it is fastened to the rim board per code and the minimum penetration of the screw into the rim board is met. A double 2x sole plate is permitted provided it is independently fastened per the code and the minimum screw penetration per the table is met.